Jonathan’s 19 years of experience in youth sports instruction began when he started ducking out of graduate classes at the University of Chicago to watch his daughter’s T-ball games. This led to years of travel softball that included founding a softball organization, training, coaching and managing various teams and pitchers. He studied Engineering and Aviation as an undergraduate, which founded his curiosity of how processes and mindset dictate how everything works. While working as a flight and SCUBA instructor in college, instilling the skill set to establish confidence, calmness, quality and safety were imperative. 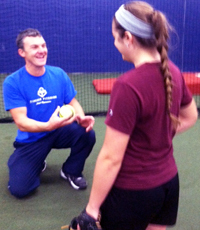 Since 1997, he has been devoted to the continued study and improvement of related processes and outcomes with girls pitching, through private instruction and experiments. I’m somewhat of a professional student of things that interest me and make no apologies for seeking out the best educators in their respective fields. After years of traveling the country, in search of solutions for two common pitching problems my students were struggling with, I came across an Angela Tincher video clip. Her mechanics intrigued me enough to seek out Denny. I talked with him a few times, trying to see what, if anything, made his philosophy different. During our second talk, he said something that made it imperative that I drive 13 hours to learn more from him. After my second trip to see him, it clicked! Although I was ecstatic to begin applying this new information, I was equally frustrated that no one had taught me this over a decade of learning. In short, he took a two page breakdown listing traditional pitching steps, removed everything that promotes tightness, twisting, tearing and jerking; leaving increased velocity, movement, endurance and enjoyment as a result. Jonathan was tough from the beginning. He demanded proof, logic, and to understand the science of the things we were doing. We absolutely loved that about him. He was not willing to accept anything just because I said it. When he saw great results with a kid, he made me go back over the things that had occurred and explain exactly how and why it worked. Often he would have great suggestions on ways to help the kid understand and take it to another level. Jonathan is always asking “why?” and “how can we do it better?” Once he has the answers he cannot wait to take it home to his pitchers. When he returns, he has already come up with new approaches from which we all learn. Always curious, Jonathan brings a freshness to lessons that kids love.